Guitars are usually constructed in an environment where humidity is meticulously controlled. Manufacturers and luthiers know that extreme changes in the atmosphere could cause wood to warp or swell before its even finished. When you buy a guitar, maintenance is down to you once you get it home. Despite spending hundreds (if not thousands) of dollars on it, many people don’t give humidity a moment’s thought. The consequences of not regulating this are serious: cracks, warping of wood, or in extreme circumstances, even frets becoming loose. This is where a guitar humidifier can save the day. In this article we’re going to walk you through all the things you need to consider when purchasing a humidifier, starting with whether you need one in the first place. From there we’ll discuss the different options available, and we’ll show you the best ones on the market. Ok, let’s get started. 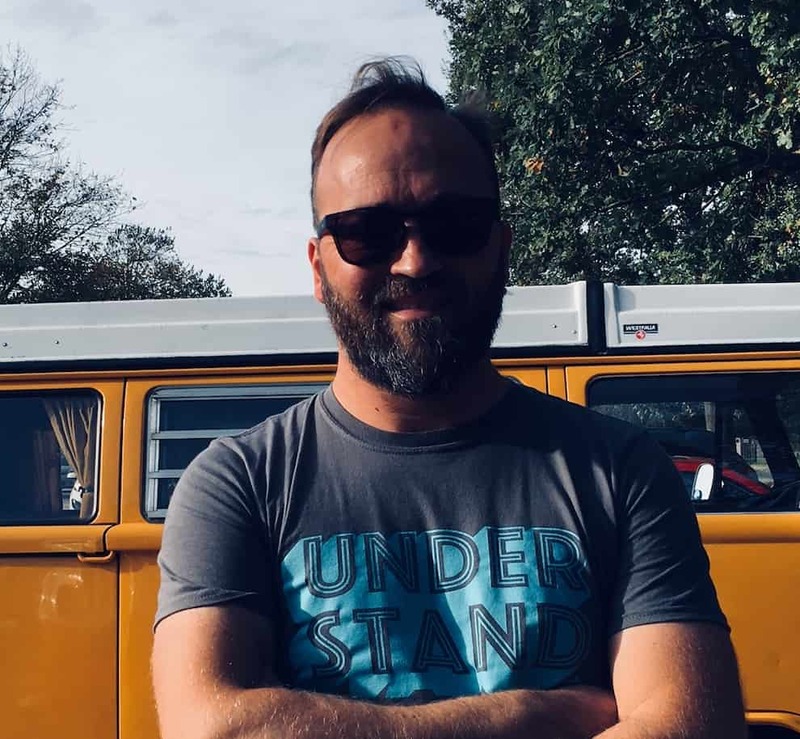 Here’s what we cover in this article, jump directly to a section of interest or preferably start from the top and work your way down to ensure you make the right purchasing decision. What is a Guitar Humidifier? Is My Guitar at Risk? How Do I know If I Need One? In a nutshell, they regulate the level of moisture in and around your guitar to prevent it from ‘succumbing to the elements’. However, important as this is, managing humidity isn’t the only thing you need to do – you also need to regularly be polishing it to keep grime, sweat, and dirt under control, paying special attention to the fretboard, which is the ‘nerve center’ of the guitar (for this you should be applying fretboard oil every so often to keep it sufficiently greased up). Many of us live in states and cities that are built in dry, arid environments. In summer, air conditioning is on; then when the temperature drops, we turn on heaters and radiators which dries out the air. If the relative humidity in your home drops to under 30% for long enough, damage to your acoustic guitar’s body wood can start to take place. Fluctuation in moisture is a big problem too: if where you live experiences extreme or even moderate fluctuations in moisture, you’re at risk. So what’s the perfect level? Opinions differ, but according to Taylor, the perfect environment is 47% humidity. Moisture levels in guitar workshops are kept around a constant 45% – by heating your home, your indoor moisture levels can get as low as 20% – that’s quite a difference. Maybe you’d read that a dry environment may even enhance your tone? Well, aging can cause cell crystallization and hardening of a guitar’s body wood – which results in a louder, more dynamic sound – but remember, this has nothing to do with dryness, which is responsible for irreversible, structural damage. In very humid, wet environments you run the risk of body and neck wood swelling. This warping effect creates changes in the bridge and action and can reduce the quality of sound that the tonewood produces. 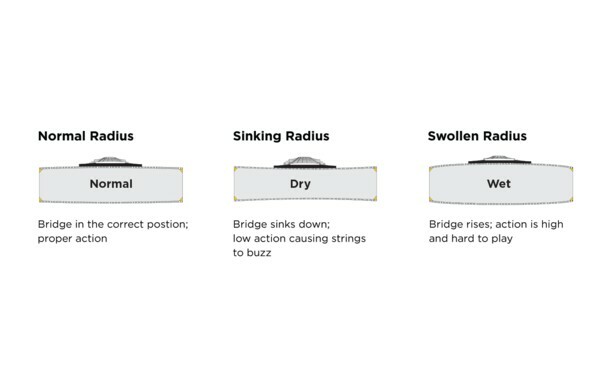 If your six-string becomes too moist, the bridge rises, and the action becomes high and challenging to play. The following illustration from Taylor demonstrates the effect of both dry and wet environments. So how do you know if your climate is too damp or dry? You could buy a thermometer and digital hygrometer to monitor levels, but a much simpler way is to ask yourself this: do you live in a desert like, arid place? Or in a humid, damp climate? If you do, then chances are you need a humidifier. Once you’ve established you need one, there are a few considerations before you go buying one. First up, which type. There are broadly three varieties: soundhole, guitar case, and room products. Let’s look at each in turn. Soundhole ones are by far the most common type. They are based around relatively simple technology: the hydrating component usually consists of a removable sponge, which is either placed within your ax’s soundhole alone or inside a container to provide one-way humidification to the guitar’s body wood. Sponge-based models can be replenished with water once dried out, and reused over again. Some types of soundhole products (see the Humidipak product review below) allow two-way control of humidity – by letting water vapor out in dry environments and by absorbing excess water in more humid conditions. They can also be placed inside the soundhole and sealed to humidify the body, or wedged between the G and D strings to humidify the body, neck, and case. Due to being for single instrument use, soundhole products are suited for players with maybe one or two displayed guitars rather than a roomful. These work using a similar concept to soundhole ones but are designed to hydrate your guitar while it’s in its case. They sit in the case alongside your guitar, usually next to the headstock and rehydrate it by releasing water vapor when necessary. They are an excellent option for the busy, touring musician – always on the move, as they don’t need to be dismantled before playing. Room humidifiers are often a general household necessity in homes suffering from extraordinarily high or low humidity; however, they can also help maintain your instruments quality. A huge bonus of using this type is they can stabilize the atmosphere of an entire room and can, therefore, maintain the moisture levels of several guitars at one time. Where do you store your guitar? Will it be kept in its case, on the wall or a stand? If you’re going to be storing your guitar in a case, then unsurprisingly a case humidifier is probably best. On the other hand, if you like to display your ax, a soundhole or room-based one is the best way to maintain its quality. The number of guitars you have also has a bearing on which product you go for. If you have a collection it will be more practical to buy a room humidifier rather than having to mess about with individual units. Travel much? If you’re going away for a holiday, it may be worth providing some extra hydration. You could do this by using an additional case humidifier to use along with your soundhole humidifier and sealing your guitar in its case. It’s worth bearing in mind that a soft case or fabric style case will leak out any water vapor that is collected. If you’re going to store and humidify your guitar correctly, you’ll need a hard case with a good seal, to prevent dehydration. Now, to the products. To make your search easier, we have reviewed some of the best ones on the market. This D’Addario Humidipak is the result of a partnership between Planet Waves and Humidipak. This can function as both a soundhole and a case humidifier and provides two-way control by releasing or absorbing water vapor depending on atmospheric humidity. This way, the Humidipak maintains a constant 45% relative humidity, an ideal climate for wooden instruments. This particular kit comes with three Humidipaks and two soft mesh pouches – one for the headstock and one for the soundhole. The mesh pouches help prevent any damage occurring to your instrument’s finish. 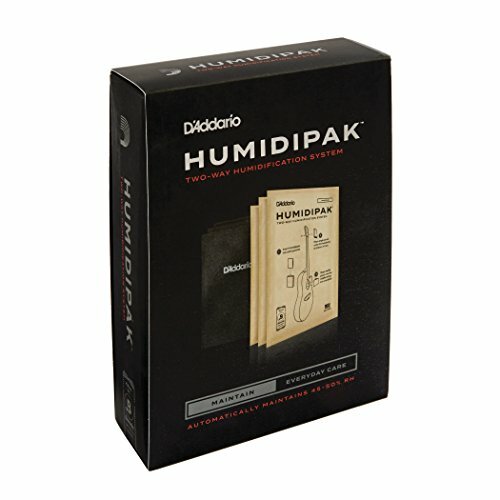 The D’Addario Humidipak is relatively low cost and will usually last between two to four months, depending on your particular location and environment. The simplicity and convenience of this product make the D’Addario Humidipak best suited for beginners – this product is practically impossible to use incorrectly and least likely to damage anything. The D’Addario Humidipak may also suit very busy or touring players, as no time or effort is needed to use this product. A favorite with many players, the Music Nomad’s ‘Humitar’ fits into the soundhole with a shallow profile. This unit uses a sponge based technology to hydrate instruments in dry environments. This is a great advantage over units with higher tops, such as the Oasis (below), which can hit the top of the case before you close the lid. With such a low profile, the Humitar doesn’t have this issue. 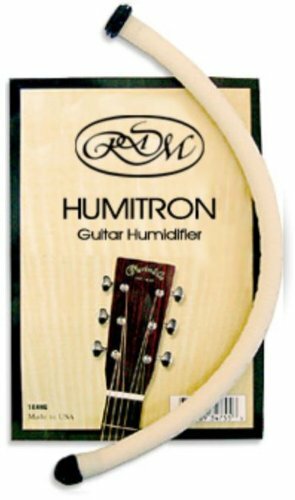 The Humitar’s low profile makes it an excellent humidifier for the traveling guitarist, or anyone that stores their instrument in a case. It is also pretty low cost in comparison to others, especially room humidifiers, making it a great investment for those shopping on a budget. Another bonus of the Humitar is that its Humid-i-bar sponge allows it to be reused – making it a significant long-term investment for any buyer. 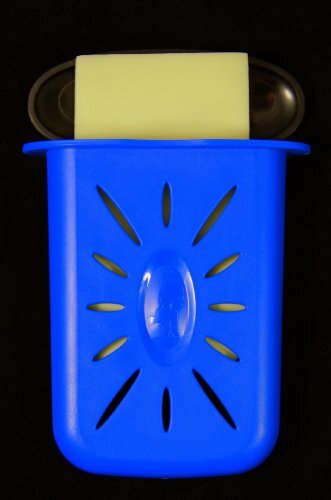 The Humid-i-bar Sponge also holds ten times its weight in water and implements a unique anti-drip technology. The Humitar’s longevity makes it perfect for the novice player or those that don’t have the time to check humidity levels every few days. If you have your guitar displayed on a stand or wall mount, you’ll want to consider investing in a Kyser Lifeguard. This provides hydration by covering the entire sound hole, allowing uniform humidity distribution to the guitar’s body wood. 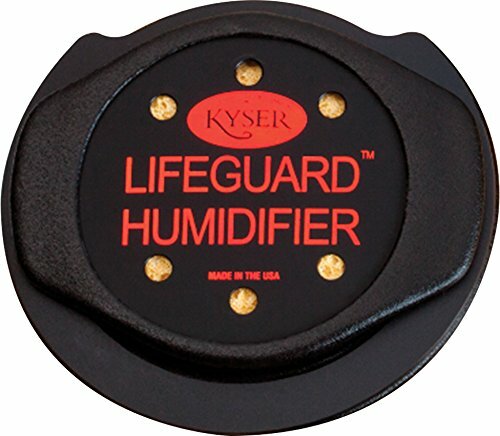 The Kyser Lifeguard comes in two sizes 3 3/4″ and 4 1/8”. 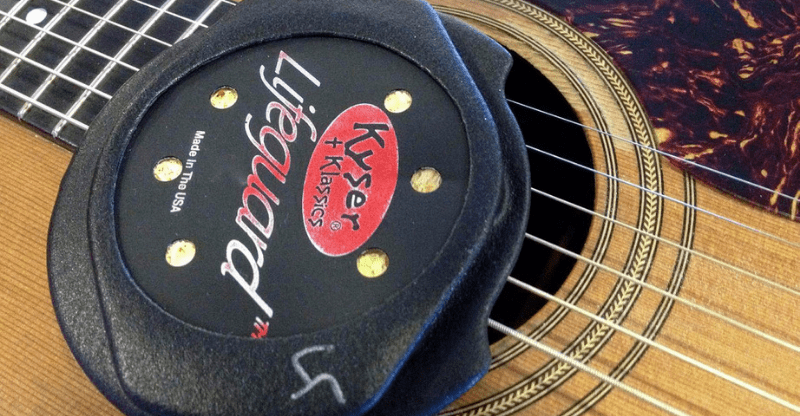 The beauty of the Kyser Lifeguard is that it keeps moisture circulating inside the body, whereas other products such as the D’Addario Humidipack (see above) are less efficient, leaving most of the sound hole exposed to external dry air. This product is most suited to intermediate players, with just one or two guitars, rather than a roomful, as fairly regular maintenance is required to keep this hydrated. The in-case Oasis Instrument product is perfect if you need ‘in case’ care and hydration. They are expertly designed to raise the humidity level of the neck and body wood. Even if you live in an arid climate, experts say this product can add an extra 10% humidity if required, due to its specialized humidifying crystal salts. Although the Oasis Instrument is more expensive than some of the soundhole ones on the market, it has a lot of beneficial aspects. For example, this model lets its owner know when rehydration is required and offers two levels of protection to prevent damage by leakage and overfilling. The Oasis Instrument also contains neodymium magnets, which allow easy placement and reattachment of the device inside all types of the case. Conveniently, this gadget also comes with a 10cc syringe to help you fill it with water. This Oasis Instrument is perfect for people who live in arid climates, or serious players with expensive guitars that need very safe humidification to protect their instrument. Can take a while to resuscitate if allowed to dehydrate completely. The tube-shaped gizmo from Martin is a great option for those on a budget. This product starts hydrating your instrument once the tube has been filled with distilled water and fitted between the strings. The hydrating element of this product is highly effective due to being made from superfine material, which allows it to absorb up to ten times its weight in water. To maintain consistent hydration, the tube also contains several tiny pores that slowly emit moisture into the body and case. The tubes are sourced from the finest non-vinyl and non-allergenic resin, making this product soft enough not to exert pressure around the soundhole and strings, and sufficiently sturdy to minimize contact with the inside parts of the guitar. It’s also very similar to other tube-shaped humidifiers, such as the Dampit series, and can be reused by just topping up with fresh water before it completely dries out. This is one of the best options for the traveling/gigging musician or those shopping on a budget, due to its price and effective moisturization. Although more expensive than the case and soundhole variety, the MistAire Ultrasonic Cool Mist will maintain the humidity of an entire roomful of guitars, rather than just one or two. Its ultrasonic mist technology enables continuous, safe moisturization of the air in a room for up to 16 hours, so all your six-strings can get consistent humidification without risk of damage. MistAire’s high and low-speed mist settings also make this highly adaptable to different atmospheres and climates too, making it ideal for players living in a variety of regions. 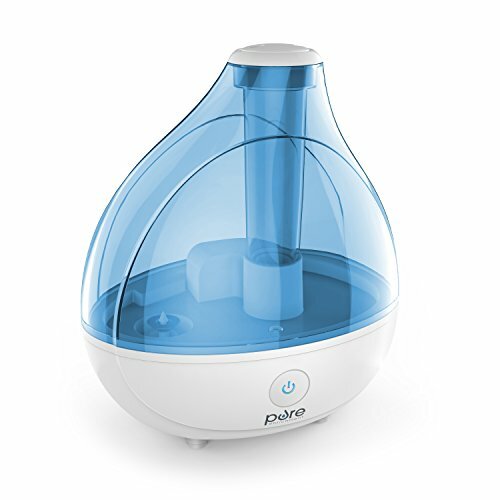 Additionally, the MistAire Humidifier can hold 1.5 liters of water, which provide ideal coverage for medium-sized rooms such as bedrooms and offices. It’s worth mentioning that the range may not be so great for larger living/ dining rooms. Conveniently, this little wonder also offers automatic shut off technology. This allows the device to turn off automatically when the water level is low or if the water tank is removed, preventing damage occurring to the machine. It also comes with a handy disk cleaning brush and a two-year warranty for peace of mind after purchase. This product is most suited to players with multiple guitars in arid environments, due to its ability to deliver intense hydration to an entire room at a time. 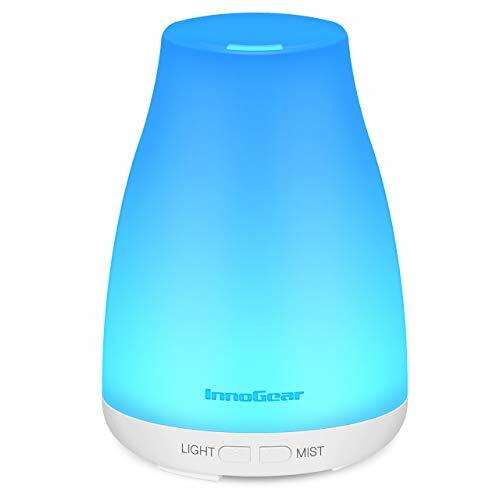 The InnoGear Cool Mist is a unique product in that it quietly humidifies your home whilst diffusing the fragrance of relaxing essential oils. The two modes: intermittent mist (30 seconds on and 30 seconds off) and continuous mist mean that this product from InnoGear is well suited to humidify small to medium-sized rooms, in different climates. It has a smaller capacity water tank than the MistAire above and holds about 100ml. Its advanced ultrasonic technology allows diffusion to take place for three hours in continuous mode and six hours in intermittent mode. Its best suited for people with multiple guitars, living in more temperate climates – and with a love of fresh scent! Although relatively simple devices, humidifiers are a necessary addition to every guitarist’s gear selection. They work by stabilizing the relative humidity in a room or by directly managing a guitar’s humidity levels. Either way, they reduce the chance of significant structural damage to your instrument caused by the atmosphere. All the devices we reviewed have their strengths, however, if you’re looking for a soundhole product, Music Nomad’s ‘The Humitar’ is hard to beat – simple to use, reusable and its low profile makes it easy to transport while in a case too. If you aren’t keen on inserting anything into the guitar’s body, Oasis Instrument offers a great product – it’s magnetic clip and attachment device also make it practical and easy to secure anywhere in your guitar case. If you have several guitars on stands or hanging on the wall, the MistAire Ultrasonic Cool Mist is the best option for you. This room humidifier enables continuous, safe moisturization of the air in a room for up to 16 hours, making sure all your axe’s get consistent humidification without risk of damage. That said, you can’t go wrong with any of the above. The most important thing is to get a guitar humidifier before it’s too late.